Poker is a game which is as much dependent on luck as it is on skill. But you do have a hand in the luck that is brought forward on you, as the saying goes, ‘you make your own luck’. Playing against various opponents brings in a lot of interaction with characters, some who seem to know it all and others who are just trying to get into the game of poker. You might think that going with the flow is the way to play poker but that is just for a beginner who is thinking of moving to the big league. If you want to win poker games and a lot of them, you need to put the fear in your opponent. The game is about psyching opponents out and here are some tips on how you can play poker and intimidate your opponents. Being the aggressor at the start of the game is a tactic that works against the weak players. Seasoned veterans might not fall for this trick but newcomers are suckers for tactics like this. Eventually, if you are seen as the aggressor in a few hands, players will let you control the game and will be scared of going up against you. Poker might be fun but only if you are winning. While having a good game works, the look and feel you give out to opponents also goes a long way into instilling fear in them. There are top players out there who wear loud clothing or go with dark colors, to give out a negative vibe. Some players also wear large, dark sunglasses at the table, even though they are playing indoors. This is done for two purposes, one to scare the opponents or intimidate them and the other reason is to keep their reactions (pupil dilation) in check and not give away too much. Now this tactic can be looked down upon by many people but it is still an effective one. Remember when you were a child and you would constantly ask questions and irritate people? Now bring that tactic on the table and irritate your opponents, however, there is a thin line and most should not cross it when trying to get under the skin of your opponents. Be a little loud and proud but not going overboard, the more you get under the skin of your opponent, the more mistakes they would make. Another tactic that you can pick up is to be a very messy player. Why would you want to play the game in a messy manner? To fool your opponents, let them bring their guard down and then you can attack them. Make a couple of rookie mistakes, keep your chips and cards in a messy fashion and people will think you are a novice at the game, lose a couple of easy games and then take them out when they drop their guard. The key to being good at poker is to keep an eye on what is going on at the table and with your opponents. People give out real clues as to what they are feeling through certain body movements or gestures, ‘tells’. So keep looking at what your opponent might be doing and try to understand their psychology. Exploiting this would be the ultimate win as they wouldn’t even know what hit them before it is too late. Keeping your cool while playing the game is something which most players do not do. They get sucked into the game and make decisions which are emotional and that brings about a change in fortune. Do not let emotions get in the way when playing the game of poker. Take your time in making the right decision. Do not get tied down or react to how another player behaves or reacts, that is something a newbie would do, keep your cool and play the game on what is going on at the table and not what could happen. Nothing works like the old stare into the abyss, never flinch and look straight into the eye of your rivals. Whenever you are calling or betting or folding, look them in the eye and scare the life out of them. Like a nightmare, this tactic will haunt them and keep them frozen while you enjoy the game. The psychological effect of this is amazing on the weak players and should not be taken lightly. Do try to keep it to a limit and not completely act like a freak at the table. Remember, while you are trying to ensure that other players are intimidated and are fearful of your presence at the table, certain players will not be taken aback by these tactics since they have seen these things a dime a dozen. So try to play your natural game at times when this doesn’t work but don’t back down from what you have done. If you were staring at people in the eye and it isn’t working, do not just switch it off in one go, slowly switch if off or you will seem like the weak link in the game and players will not feel threatened by you. Conversely, there will be a lot of players who will employ the same tactics against you. Do not try to copy their acts at the table but keep your cool and keep an eye out for any tells they may display. Poker is a tough game played by many people and you are not the only one trying to put the fear in the opposition. 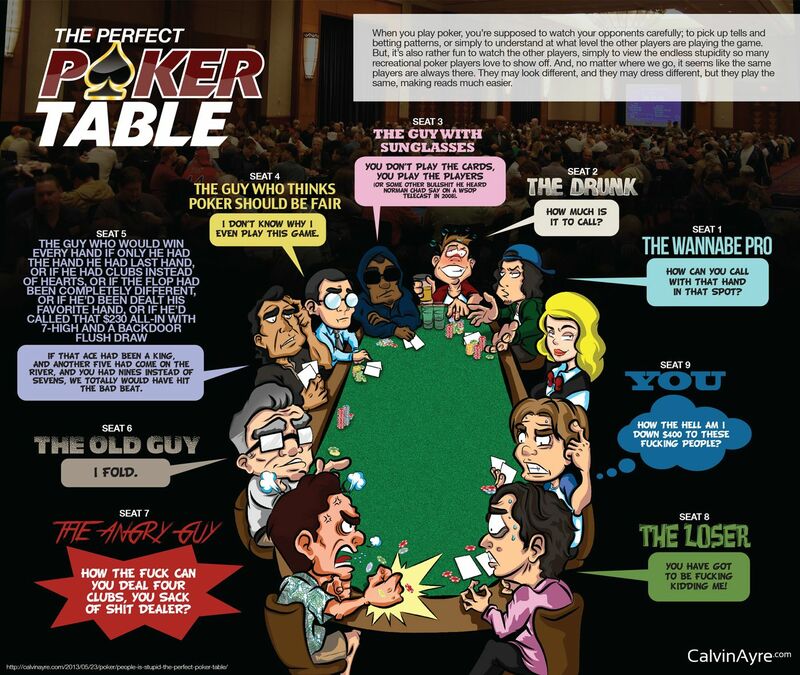 Perfect Poker Play: Is There Such A Thing? Good tips, I find the psychological aspect of the game very interesting. If you get your opponents to fear you – you have a come far! Makes a lot of sense especially when playing for large amounts of money. Yes, but also useful on all level of games. A certain amount of fear is always a good thing. Haha, I fear you now Mary.